Welcome to the bake sale! DC State Fair bake sale spread. A visitor enjoying her pumpkin whoopie pie. Photo by Michon Boston of Church Lady Cake Diaries at churchladycake.com and of Eatonville's blog at eatonvillerestaurant.com/foodstories. 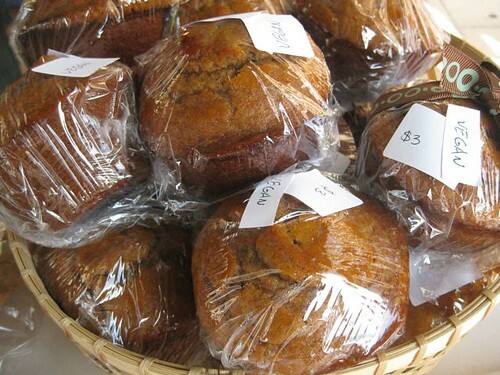 Delish vegan pumpkin muffins that were raved about on Twitter. The early volunteer crew, including DC State Fair organizers and bakers/volunteers. 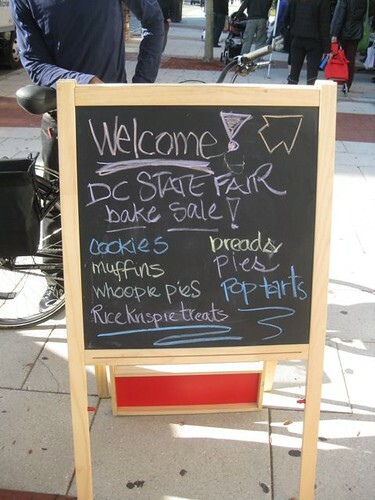 Thank you to all the local bakers who donated their beautiful, delicious goods for the DC State Fair Bake Sale Fundraiser this weekend! Because of your support, and the support of the attendees at the Farmers’ Markets, our followers on Twitter, and others for getting the word out, we reached our fundraising target, and all the funds raised will go toward fees for filing forms with various government agencies. A special “Thank You” and “Congratulations” to Fat Man After Dark, a 2010 DC State Fair sponsor who bid on and won the Cherpumple, baked especially for DC State Fair by The District Chocoholic. 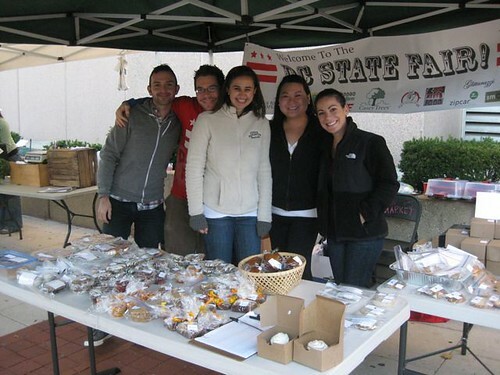 Another special “Thank You” goes to the 14th & U Farmers’ Market and the Bloomingdale Farmers’ Market for hosting us for the sales, and Garner’s Produce for providing a tent for DC State Fair to sell underneath. An extra-special “Thank You” goes to all of the volunteers who donated the baked goods and their time for the bake sales: Adventures in Shaw, Christine Mellen, Christine Taylor, Genevieve V. Billia, Hilary Nelson, Jazmin Gargoum, Joy Tranel, Kari Nye, Melanie Hirsch, Nikki Rappaport, Rachel Friedman, Raquel Maya, T. Marshall Fawley, Tammy Seltzer, and William Chumbris. Thank you, DC, and look forward to more DC State Fair events! Most photos by Jenna of ModernDomestic. More here! Next Next post: Say Hello To The Board!